BlogHome | Blog | Why Multifamily Properties? Multifamily real estate investing has become the perfect business investment opportunity because of the basic principle of supply and demand: The credit crunch, overheated housing market, and economic downturn have all contributed to a virtual freeze in new construction. This has led to an increasing rent growth and occupancy rates, which has led to the appreciation of value of apartment buildings, and in turn, the return growth of those who invest in multifamily real estate. Simply put, people have always needed a place to live, and always will. As grown children move out to form households of their own, and the lifespan of aging baby boomers have become longer, multifamily real estate investing has a very lucrative, high yield opportunity that will provide owners and investors a strong and continuous return. As we speak, the demand for multifamily real estate continues to rise. 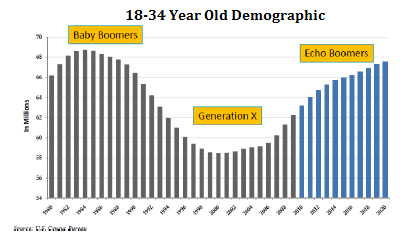 Echo Boomers and Milleniums (which are collectively called Generation Y), the biggest generation of youth since the Baby Boomers, representing one-third of the U.S. population, are starting to come of rental age, that being 18 to 34 years old. Much of this population is more mobile than previous generations and prefer to rent rather than buy to maintain their ability to relocate easily if desired. The number of people who turn 18 year after year is good news for multifamily owners and real estate investors as the number is significantly great. Not only do most of these young people go to college and get their first jobs, they will also be looking for housing, most often in apartments, driving demand for student housing, and B and C class properties. According to the US Census Bureau, between the years of 2008-2020, approximately 57 million people will reach the age of 22. There are also people in older demographics that rent during transitions in their life; whereas others are simply perpetual renters, without any desire or means to buy a home – a portion that is on the rise due to the foreclosure crisis and recent economic downturn. Additionally, the aging Baby Boomers who downsize to rental units are estimated to reach 10 million over the next ten years. All of these different populations create a very strong and steady market for multifamily housing. At Resolution Capital Management, we understand the market dynamics that surround multifamily housing and have intimate knowledge of the markets which are poised for optimal growth and maximum return on investment. For further details, read our section on Multifamily Synidications here. Real estate investing outperforms the stock market for a variety of reasons. Investors are more directly in control of their real estate investments than they are with publicly traded stocks, are not subject to the whims of large conglomerates that determine that market, and can more quickly adjust to changes in the market. Additionally, the element of leverage in real estate offers more buying power than in stocks, and (not including the very rare circumstance) it is not typical to experience a total loss in multifamily real estate. Multifamily real estate has also proven to be the most stable of all commercial asset types. While all commercial asset types do well when the economy is strong, retail, warehouse, office, and industrial assets often lose major tenants and can lie completely vacant during bad times. But with multifamily, owners can respond better to changing market conditions by offering concessions and incentives to prospective tenants to keep their spaces occupied. Even in stagnant markets, multifamily real estate investing still outperforms other commercial sectors because people never stop needing a place to live. With the steady influx of housing foreclosures, people are renting in apartments, which is an affordable, and sometime only, option. Renting an apartment can provide the opportunity to begin a rental history, rebuild credit, build savings for possible future homeownership, provide flexibility in this uncertain job market, and offer a home for everyone from students to seniors. 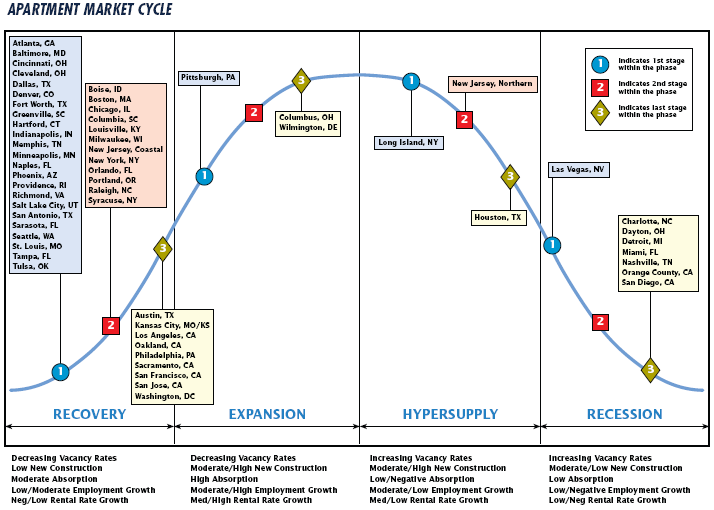 In nearly all markets, multifamily real estate investing proves its resilience during this time of recession. Throughout the downturn, multifamily fundamentals have shown themselves to be the most stable asset sector. All indications show, according to experts in the multifamily arena– from brokerages to REITs to media and analysts– multifamily real estate investing will remain strong in both the near and long term.